Now that it’s been out for a while, many MusicMaster users are wondering if it’s time to upgrade to Version 7. Let’s look at a few of the many changes to help you decide. The first change you will see comes before you even get into the program. A new Welcome screen offers you a chance to go through some of the recent articles by MusicMaster staffers (always worthwhile) or go right into the program by choosing your station on the left. If you find this to be an annoyance, it can be easily bypassed by unchecking the appropriate box. Once you’re in, you’ll find V7 retains the familiar ‘look’ and navigation that we’ve become accustomed to, but as with all previous major updates, the graphics have been freshened with new, more contemporary icons and just a more pleasant overall appearance. In keeping with the times, the program is now designed for displays using a resolution of 1024×768 or higher. The biggest addition to the program is the ability to create your own fields (e.g. “Title”, “Artist”, “Tempo”, etc.) 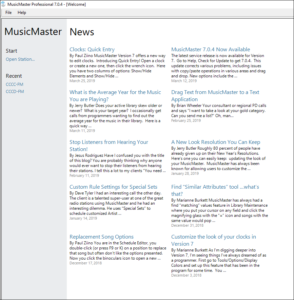 Previously, stations had to send their database to MusicMaster to add more should they use up all the fields they had when they first received the software. For most people, working with Fields isn’t something they would normally be doing, but for power users, the ability to make new fields for additional attributes or recreate an existing field to allow for exact text characters is very handy. 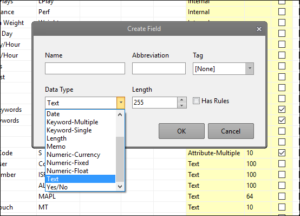 Also, numeric fields can be made to replace some text fields to allow for easy analysis. Deleting fields is not offered, but I’m hopeful that it will be at some point in the future. I understand that the risk exists to accidentally get rid of a field that’s in use, but providing the option along with proper safeguards would be nice to keep your field list tidy. 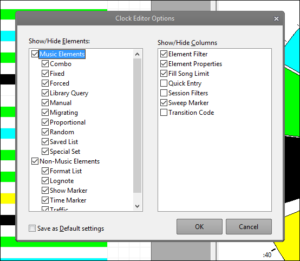 You can now use the Clock Editor Options to tailor which elements and columns you normally use. Personally, I like having all the element options available, but I am choosy when it come to which columns appear. Elements have been added to the InfoBar (with balloon tips), allowing you to drag and drop them into clocks. Some other great additions include: the ability to copy elements from one clock to another (two thumbs up! ); right clicking on a category to the songs in it; and double-clicking on the appropriate Properties square to go directly to the tab you want (two thumbs WAY up!). 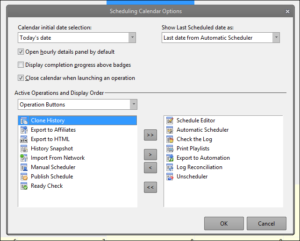 The Schedule Calendar has been expanded with a lot more Calendar Badges that can configured the Schedule Calendar Options. 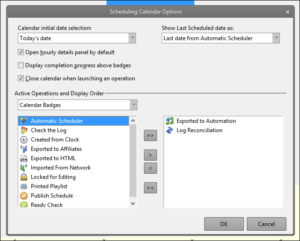 The Operations Buttons can also be organized in the same window with more options now available. As with any major step up, people (and particularly IT staff) are always wary of upgrading too soon. That’s certainly understandable and the reason why I’ve waited this long to write something. If you are concerned that upgrading will be a hassle – don’t be. If you are working from a standalone located on your local drive, just download the program and install it like any other program, but you might consider renaming the installation directory from the default “MusicMaster” to “MusicMaster7.” That way, you still have your previous version should something unforeseen happen. For network users, let your Engineer or IT person do the deed. It’s unlikely you have the user rights to do it yourself anyway, and if you did you should still let them do it – no need to get yelled at! The database conversion is as simple as copying it over into the new directory and opening it for the first time. I recommend it, but I’m also a geek and I understand that most people aren’t. If you are worried that you will have to relearn your daily editing and maintenance, you won’t. While additions have been made to the program and it might look slightly different, you can rest assured that it still works the same way. That said, if you are happy with your current version, and you don’t normally dig too deeply into areas of the software beyond scheduling and adding music, then the question “Why?” is a valid one. In short, you don’t have to upgrade, but after using MusicMaster Version 7 as I have for the past number of months, I’m confident that you will be happy that you did.